Killer Characters: Read to Death is BIG!!! And a Giveaway! Read to Death is BIG!!! And a Giveaway! Here on Fort Myers beach, there is much excitement in the Read ’Em and Eat café and bookstore. In our last adventure, chronicled in the book Read to Death, Bridgy went from witness to suspect in thirty seconds flat when a local van driver is murdered in our parking lot. We’d just returned from an outing with the Cool Reads/Warm Climate Book Club made up of local residents and snowbirds. We visited the Edison and Ford Winter estates where Thomas Edison and Henry Ford spent their winters a hundred years ago. Everyone had a fabulous time---right up until the murder. I am mega excited to let you know that today, July 19th, is the release day for the LARGE PRINT EDITION of Read to Death. When my father visits me in Fort Myers Beach, we always go to the library. He heads right for the large print section and he is not alone. 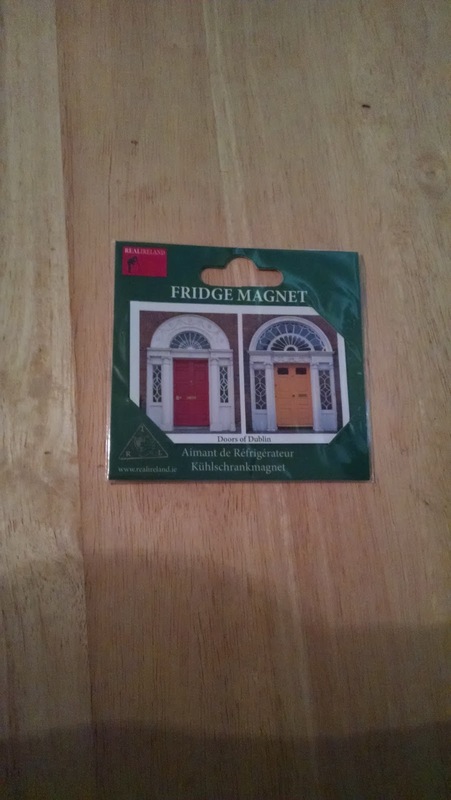 To celebrate this momentous event, our author, who has just returned from Ireland and Northern Ireland, is holding a wee giveaway of this lovely refrigerator magnet depicting two of the famous Georgian Doors of Dublin. To enter for a chance to win please comment below and tell us anything at all about large print books. You love to read them, you hate to, your mom reads them, you have never seen one—we want to know. Please include your email in this format: yourname (at) your server(dot) com—so the spambots can’t pick it up. Comments close at midnight on Friday, July 21st. Cool library!! I donate my large print books to the Fort Myers Beach Library, the community that is home to the Read 'Em and Eat books. I am rather indifferent to them but my mother loved them. I don't have to read them yet, but have always been pleased to see that our library has a good section of them with a wide variety of genres. A co worker stopped in at my branch because of that! Thanks! I don't need them, but if there is a copy of a story I like, I will check it out. Sure helps those that has a problem with small print. I love large print books. I'm almost 65 so you see the reason. I don't read them, but anticipate I will need to in a few years. I am happy they exist. My local library has a decent selection. Congrats on the release! I love them. Our library has a good selection large print, and I always enlarge the font on my e-reader as well. Thanks for a cute giveaway. Large-print books are hard to find. But when your eyes are tired from looking at screens all day at work, they're very soothing. I like the large print books because they are easier to read in poor lighting. Which my apartment has. I am legally blind and was born with cataracts. I love to read Lamar get print book or on my kindle where I can adjust the print big enough for me to read. My family and I were in Ireland in 2014. I loved seeing the beautiful colorful doors in Dublin. 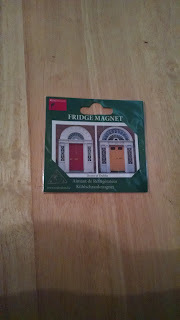 That magnet would remind me of our trip, if it was on my fridge. Thanks for a chance to win it. I am not a fan of large print for myself though I will read one if that is the only format I can get my hands on. I do love how they help people that do need them. I like anything that helps people read more. My email address if jelrobb (at) gmail (dot) com. I love large print books. Ever since 40 my poor eyes have gotten worse and worse. My library has a very large section of large print books. I love large print books...my eyes are fine, really! At least that's what I tell everyone, but the squinting is a dead giveaway. No matter what light the large print books are clearer and more legible for me to enjoy. Thanks for the opportunity...I love this series!